Welding can be an excellent hobby, and extend to an interesting way to make a living as a professional welder. In the old days, it was possible to create a welder with a couple of car batteries, some wires, and a rod, and then you could make some basic trail repairs. The adage rings true when it comes to quality welding – you get what you pay for. When searching for an excellent home and shop welder, Hobart’s new Ironman 230 MIG Welder stands out. 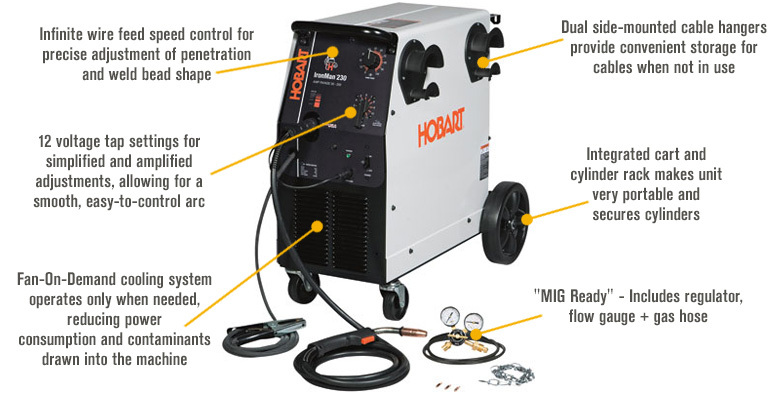 This MIG welder is a complete redesign of Hobart’s full-size line welding units. It will deliver 30-250 amps for welding thick to thin steel, stainless steel, and aluminum. 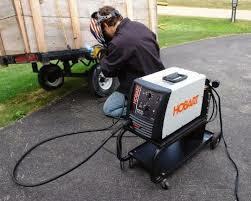 The Hobart Ironman Welder has been found to be a breeze to set up and very easy to use. The unit lays down exceptional welds while evenly penetrating metal that cheaper units are unable to. 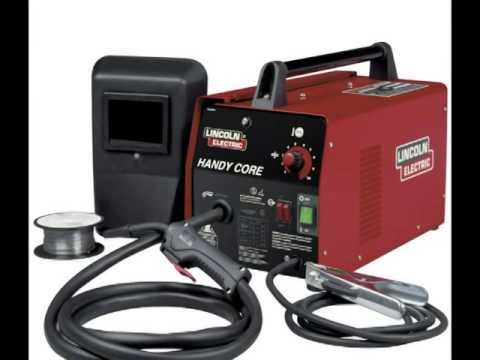 If you would like to ramp up your welding and invest in a quality machine, this welder is an excellent place to start. The Ironman 230 is a great full-size MIG welder for a number of applications. It comes complete and ready to weld, minus a gas bottle and wire. It also has additional components which are available from Hobart, such as protective gear and consumables like welding wire, nozzles, and tips. The Ironman 230 is a total redesign of the full-size MIG platform, outperforming the competition on the arc quality, voltage control, duty cycle and value. The arc is optimized to deliver a flawless weld. For more improved feed ability with aluminum wires or extended reach with other wires, add Hobart 3545-20 spool gun with its 20’ cable length. Can be used on aluminum, stainless steel, and carbon steel as all respond well to the welding process. Eliminates the need to remove flux. Shielding is provided by the gas, which makes every job a lot easier to complete. 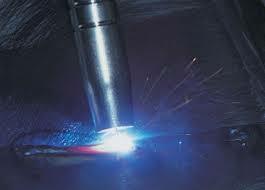 The environmental conditions that surround If you are welding in the outdoors, then any breeze around your torch can change the flow of the shielding gas, and that affects the integrity of the weld. Even indoors, a simple draft from a heating vent will be enough to cause the weld bead to puddle and make it porous. It welds thick plates together, but it will take multiple passes to make this happen. It is perfect for light gauge materials, but thicker items are going to require some extra time. Above all, there are still some aspects that support its usage making it more effective. It looks very cool and has 2 molded cable holders screw on the side to hold MIG gun, ground and spool gun which is handy. It is shipped with running gear with casters, and ready to roll with a 15ft MIG gun that will reach all around your welding table without moving the machine. Consistent care and maintenance will help you detect any upcoming defaults or damages in the equipment, and this will enable you to request for a replacement in good time. The weld parameter chart on the inside of the machine seemed high on the wire speed settings across the board. Customers have resolved the use of Hobart Ironman 230 MIG welder has paid off with one of the best arcs they have seen to date. It has been optimized to the point that a flawless weld is easier to achieve that ever before. If you are used to post-weld cleanup and dealing with splatter, even though you know your skills are good, then you will love this welder. Those issues are virtually non-existent; it is very forgiving, making it the perfect tool for an apprentice or a master. Other welders can take care of thick plating effectively, so evaluate all of your options if you are going above materials that are more than 0.25 inches thick.